Horses, dogs, and cats need exercise as much and maybe even more than we do. The living body is designed to move so that bones, muscles, tendons, and ligaments stay strong and healthy. Internal organs need movement to function properly. To keep your animals happily on the move it’s wise to pay attention to their tendons and ligaments. • Bind tendons close to joints. movement: when a muscle contracts, or shortens, the tendon pulls on the bone causing the structure to move. Your job is to help your animals to keep moving and enjoying their lives. When your horse or dog is fit, he’s less likely to experience injury or illness. And, to keep him fit, his tendons and ligaments need to be both supple and strong. There are a number of ways you can support his general fitness. Go slowly and warm- up his muscles, joints, tendons and ligaments before heavy exercise. Training on uneven terrain and going up and down hills to develop well rounded and balanced muscling. A weekly acupressure session focusing on flexibility and building strength of tendons and ligaments can greatly enhance your animal’s fitness. 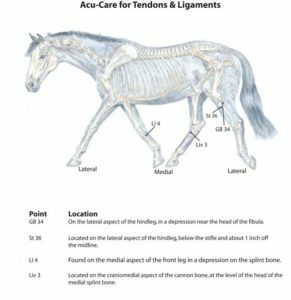 Below are two Acu-Care for Tendons & Ligaments charts identifying acupressure points you can stimulate to consistently support your animal. The canine chart can be used for both dogs and cats. Give you horses, dogs, and cats the benefit of this acupressure session every 5 to 7 days and you will be to enjoy your exercise together.